Two years ago, my husband, my daughter and I traveled to the southeast of Turkey! This region is the birthplace of kebabs (heaven for carnivores) and flat breads, capital of pistachio, baklava, pomegranate and apricot. I wanted to write about this trip for a while and few days ago I started to check out the photographs that we took when we were traveling through the region. Then I saw a picture of Künefe from Hatay city a.k.a. Antioch. Künefe is an out-of-this-world-delicious dessert and one of the reasons that people travel to Hatay! Finally, I decided to make it at home and post this dessert’s recipe right away and sorry, the travel post will wait a little longer! Künefe is also on Su‘s dessert menu since 10 years and much loved by our guests! I hope you’ll enjoy to make it at home! Prepare 5inc /12cm ramekins or small pans. Don't worry if you don't have many of them, only one will be enough. Melt the butter without boiling (no need to clarify). Set aside to cool. 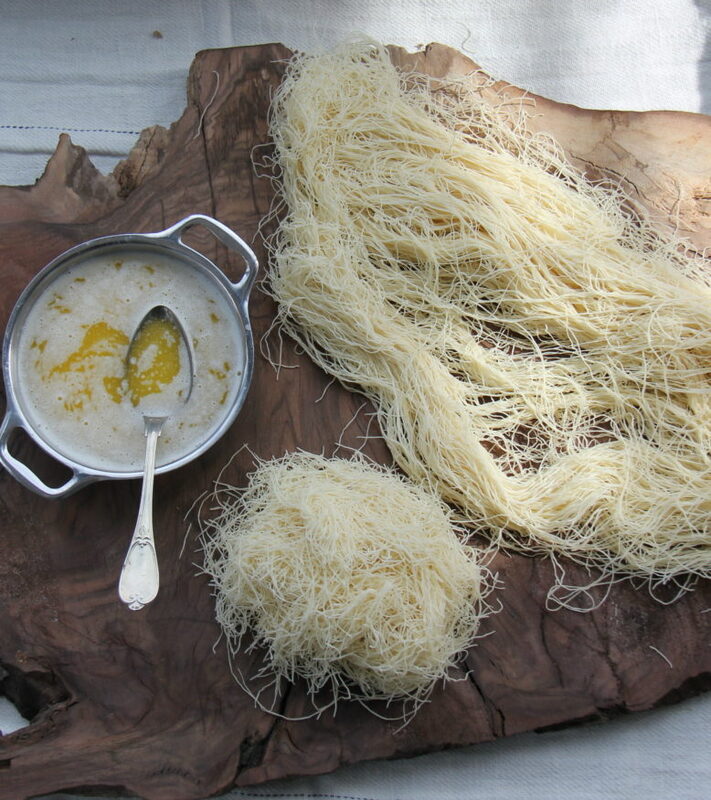 Kadayif is a long, angel hair like dough. Lay the dough on a cutting board and cut in very small pieces like vermicelli. Put the dough (vermicelli) in a big bowl and pour the butter on, then massage to combine butter with the dough. Lay stretch film in a ramekin or a small pan. 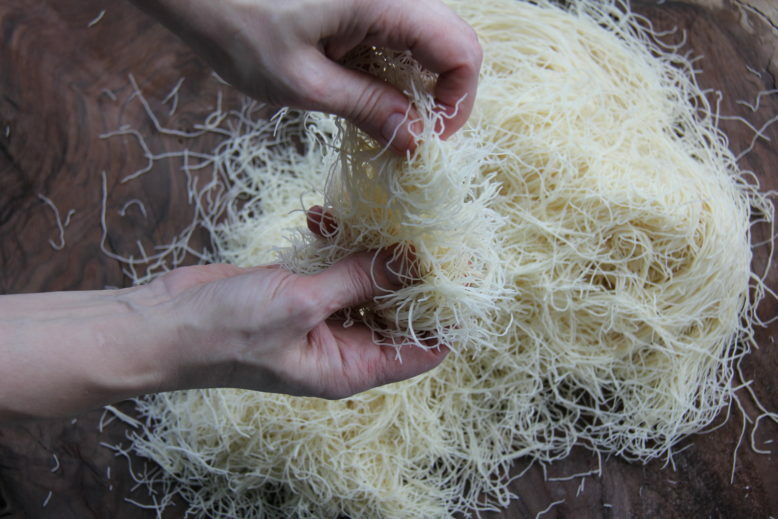 Make a 1 cm layer of buttered vermicelli in the bottom, then put 20gr cheese in the middle and cover with another layer of vermicelli. Envelope tightly with the stretch film and remove from the pan. Repeat until finish the ingredients, normally it makes 8-10 depending the size of your pan. Store Künefes in the fridge until cooking. If not cooking for the same day, they can be freeze up to one week. In the meantime, make the syrup; in a medium stock pan put the sugar and equal amount of water. Bring to boil and continue to cook about 10 minutes. Let the syrup cool completely and store in the fridge. This can be made up to 3 days ahead. To cook, return the Künefe in a same pan (if cooking more than one at the same time, place them in a cookie sheet) and cook in the oven preheated to 400F (200C). It takes 15-20 minutes. 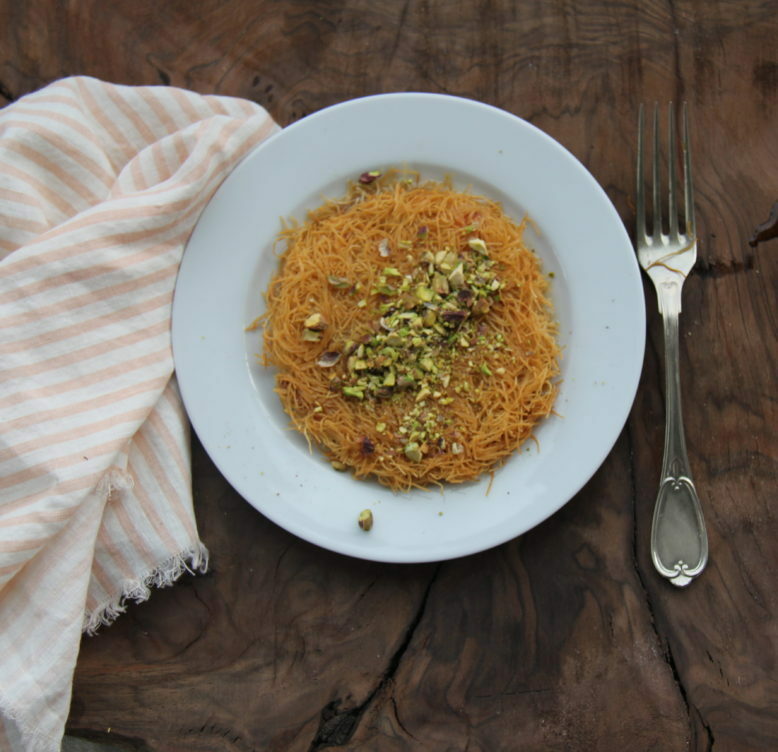 Once the Künefe is cooked to golden on both sides, take out of the oven and pour 1/2 cup (4 ounces) syrup over it. Sprinkle generously with chopped pistachio and serve hot.